What does it take to make a school successful? Many pieces go into creating a work of art. This kaleidoscope of learning begins with the needs of our children...but I'm getting ahead of myself. As the new Principal, I am excited to be joining St. Dominic Fine Arts School. I thought I would take an opportunity to tell you a little bit about myself, then give you a deeper understanding of my hopes for this school community. I am married to a teacher at Our Lady of Assumption, Susan DeForge, and have two young boys at St. Maria Goretti- Ethan, 11, and Caleb, 6. I am a competitive distance runner and a bit of a techno geek. I am a driven individual who seeks only the best for the students and staff with whom I serve. I truly try to live by Donald McGannon's quote, "Leadership is action, not position." In essence, I am willing to roll up my sleeves and try new things to benefit the school community, rather than just talk about current pedagogy. We need to see how best practice can be lived in our school. My goal is to use this Learning On the Edge Blog to update you monthly on what is going on in education and how St. Dominic School is matching it. It is important to link best practice to current practice in a school. The goal will be to encourage new, innovative approaches to learning, which will engage our students more as possibilities begin to arise. We have added Face Book and Twitter Accounts with access on our school website, which will also be kept current. In addition to these, we will be emailing out weekly updates, called The Dominic Daily. In essence, we are using technology to "blow the walls off the school" and create an open and transparent environment, so that you can get a glimpse into the learning that occurs during the course of your children's day. Along with our new Assistant Principal, Joelle Marshall, it is our goal to Inform, Celebrate and Engage you in all the good things that are happening in our school community. Our energy and passion for learning will become evident as you get to know us better; we want the best for our students and staff. As I alluded to in my opening statement, I believe in a student driven approach to learning, where students are encouraged to have voice and choice in their learning. When given the opportunity, encouragement and guidance, students never cease to surprise me with what they can accomplish. I see possibilities and potential at every turn and we must be willing to take risks to give students the chance to thrive and be engaged in their education. Risk often comes with the need to change, which can be scary, and exciting, at the same time. Another motto I live by is that, "If you want change, you have to be willing to be uncomfortable," so let's be uncomfortable together. There are two simple questions we can be consistently asking ourselves, "Why? "and "Why not? "The question "why?" asks us to reflect on our current practices to examine if they are best for our children, and the school in general. "Why not?" challenges us to be open to new ideas and approaches to all that we do as a school community. If we are doing the right things for our students, then their brush strokes contribute to the colour of this art work that we are creating at St. Dominic Fine Arts School. I have also been a big proponent of Carol Dweck's, Growth Mindset, which is the belief that intelligence, personality and character can be developed...it is not innate or static. If you believe that you can't do certain things or that you're not good at particular subjects or tasks, then you are using a Fixed Mindset; this is a very limiting approach. It is my hope that we can all approach the creation of our masterpiece with a Growth Mindset at St. Dominic's School...be it staff, parents or students. We need to be open to the concept that "Creativity is intelligence having fun." 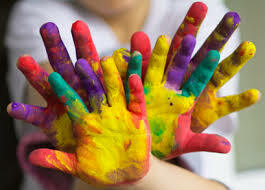 In this light, learning may be messy... but that's okay, since it allows children to freely express their learning in a multitude of innovative and creative ways. 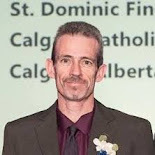 Once again, I am thrilled to become a part of the St. Dominic family and look forward to meeting all of the children and their families. I encourage each and every one of you in our school community to find a way for you to contribute to our master piece. So grab a brush, a pencil, an iPad, colours, paints, dancing shoes, costumes, props or a camera and let's begin to create our great work of art at St. Dominic Fine Arts School.